We’ve been making monitor controllers since 1999, and now make the widest range, and arguably the best stereo and surround controllers available. Each controller is sonically accurate and packed with features to help you get the best out of your work, quickly and effectively. 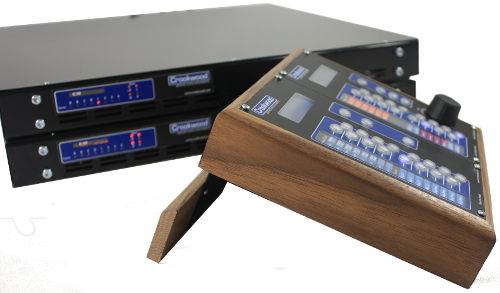 Crookwood make 6 monitor controller ranges, and each range has 3 or 4 sizes. This together with a wealth of optional add ons, means that you can get the controller you want, and that it will virtually unique to you and your needs. Because all of our controllers are constructed from a modular set of control and processing cards however, this keeps the cost down, so all of this flexibility and sonic power comes at an affordable price. Most of our controllers have record selectors, and studio control options, so rather than just a simple monitor controller, they can become the heart of your studio – like the centre section of one of the great old analogue consoles. Finally because we marry the power of digital control with analogue signals, our controllers are quicker to use in production environments, saving you time, which together with the accurate sound, makes your job easier and more accurate. Multiple analogue and digital sources? Then choose our great C1 controller or the best performing controller on the market. You need our C10 controller. Then choose our C2 controller for cost effective, but comprehensive monitoring. Have a look at our C20 controller. Then our C3 controller is the perfect choice to integrate all your existing equipment. The C30 is your best choice. If you can’t find exactly what you need from our controllers, talk to us. Their modular construction makes it easy for us to customise the features and functions of our controller to meet your exact needs. Just contact us at Crookwood for more information. At the heart of all our controller is a modular monitor gain card. It is the result of over 20 years engineering to make the most sonically accurate gain control available. Everything you hear will go through this card, and you’ll make your production decisions based on what you hear. So many monitor controllers are coloured, sometimes because it makes them sound nice, or often because they’re designed for a price. But you’re making production decisions that will affect the entire future of your project – you need to know the truth, not an approximation. Crookwood monitors deliver this truth, so you are in charge of the sound, not your equipment. Coupled with the widest range of forensic monitor checks and calibrations available, you can be sure that you can hear and diagnose musical issues, and then correct them. In front of the monitor card are our selector cards, so you can select what you want to hear. After designing a near perfect monitor card, we need to make sure that the source selection doesn’t ruin things. Thankfully we use balanced relays for all the analogue routing, and properly terminated transformer based digital routers, so your audio is handled without any degradation. We have a wide range of controllers, so whether you just need 2 inputs, or 16 inputs we’ve got it covered. And most of our controllers have a separate record path output, so you can choose a monitor source to go to a record path, cue feed or studio speaker controller. Clever integration features like automatically connecting or choosing digital converters, and routing clocks make working with your DAW or DAWs a breeze. And on the subject of digital audio, you can fit our controllers with our excellent internal D-A converters, or if you have a favourite external D-A, you can use that instead – your choice! What is truly brilliant about the Crookwood is that they’re all made from modular parts. This allows you to specify a controller that exactly fits your needs, and you can alter it as your needs change. No more bodging of weird bits of kit to get a feature you need. No built in obsolescence, waste, or unserviceable black boxes, but a sustainable living solution for your mastering now and in the future. We were early adopters of the surround format, having designed film consoles in a previous life, and we have controllers that cope with 5.1, 7.1, all the way to Atmos systems. We’ve even done a special 24 channel controller! We’ve kept the feature set useful for these controllers, so they’re easy to use and easy to check downwards compatibility. The great thing is that you can upgrade any of controllers from stereo to surround – you don’t have to start all over again. Our controllers aren’t the cheapest, but then if you’re going to do a job, you should do it properly. If you look at what they can do, how they can form the heart of your studio, and then compare, you’ll see that you’ll save quite a lot time and money in the long run. When you factor in that they will be quicker to use, smaller in terms of their acoustic footprint and will probably sound better, it just doesn’t make sense to buy the cheapest.